as we know clamping unit purpose is to keep mold closed against force when part injected with plastic material, because of that clamping force at least more than injection force, we can applied this clamp pressure both in injection machine with hydraulic or with mechanical toggle. below are clamping force calculator using java script, the script i get from http://www.custompartnet.com, with little modification so it's more suitable with blogger post page. but why i set safety factor 0.8, the result will more lower than without safety factor, in clamping force those formula is before correction for pressure drop and other, so the injection pressure always more lower than those manual calculation. thank u very much for your information. expecting more details and specifications. 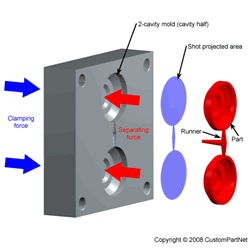 how to calculate runner projection area in 3 plate mould!!! Could you please help to determine the clamping force generated by the clips which is being bolted with 2 bolts on each side. I have used M27x2 with the torque of 959 Nm. the diameter which had to clamped is 364. Kindly give valuable suggestion on how to proceed on this type of problem. Hi there. Nice blog. You have shared useful information. Keep up the good work! This blog is really interesting and gives good details. Pressure Die Casting Machines, pressure die casting components. Thank you very much for the information, could you please me to calculate the cycle time in pressure die casting. We have 250 Tons machine.Injection pressure is 1067 Kgs/Cm2. 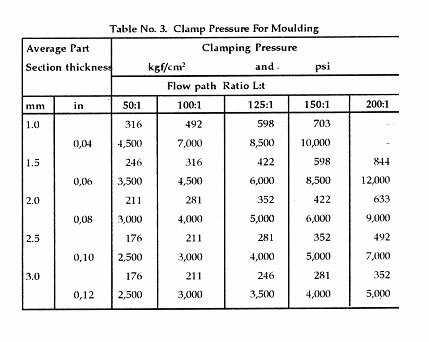 holdon pressure is 800 kgs/cm2.what is cavity pressure & what is clamping pressure.Pls.guide. I really appreciated with it, This is fine to read and valuable pro potential, I really bookmark it, pro broaden read. Appreciation pro sharing. I like it. This gives Acme Disys unconventionality in manufacturing unit. The company has made sure of deploying high end CNC machines & Vertical Milling Centres from Mazak, Makino and MoriSeiki for producing precision mold inserts and superior quality mold bases. Great idea. I enjoyed it. You have done a great job. Thanks for sharing. It help me a lot to get advanced information. Very useful information in very fluid words. Could you please tell, can we approximately tell clamping force from machine motor power and average daylight? I really like to read your post on Injection molding machines.this post is very important and helpful for me. Thanks for sharing. i want to know detailed about plastic moulding, blow moulding and injection moulding???? Thank you so much. I was quite interesting. check this out http://www.hubik.co.kr/imm.php, you will like it. It’s amazing in favor of me to have a website, which is valuable in support of my knowledge. Thanks admin. Signature - "Optimized360" the most reliable dental website company in the world. Injection molding machines are usually characterized by the tonnage of the clamping force that they provide. 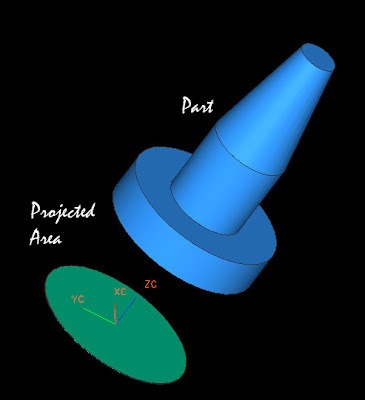 How to calculate the pressure generated in injection molded part? Woah! I'm really digging the template/theme of this website. It's simple, yet link mega888 effective. A lot of times it's challenging to get that "perfect balance" between user friendliness and visual appeal. I must say you have done a amazing job with this. Additionally, the blog loads very fast for me on Internet explorer. Excellent Blog!